Humans, driving on the 4.8 million miles of roads in the US, must learn to coexist with migrating wildlife. Due to the proliferation of suburban sprawl, planned foremost for human transportation, collisions between animals and vehicles have increased by 50 per cent in the past 15 years. A U.S. Federal Highway Administration study reports between one and two million collisions happen between cars and large mammals every year in the U.S. This represents a significant danger to human safety and wildlife populations. Moreover, deer collisions can cause 200 yearly deaths, costing $8 billion with an average property damage of $6,600, according to Montana State University’s Western Transportation Institute. As we continue to invade wildlife habitats of animals, planners are increasingly taking into account the need for wildlife to have their own roadways so as not to end up as road-kill. Truly sustainable infrastructure honors place, community identity, biodiversity, and ecological resilience. Studies have shown that roads and traffic affect animal populations detrimentally in four ways: “They decrease habitat amount and quality, enhance mortality due to collisions with vehicles, prevent access to resources on the other side of the road, and subdivide animal populations into smaller and more vulnerable fractions.” Road mortality is documented as one of the major threats to the survival of 21 federally listed threatened or endangered species in North America. Wildlife crossings have been built since the 1950s not only to protect animals and people from collisions, but to blend roads, railroads, pipelines, etc., into the urban fabric. One of the proven solutions is to build wildlife crossing structures. 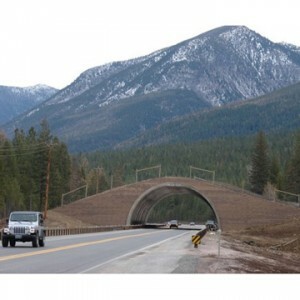 Wildlife crossings can include underpass tunnels, viaducts, overpasses and bridges, amphibian tunnels, fish ladders, culverts and green roofs. Most common in Europe, they are usually referred to as ecoducts. The Netherlands accounts for more than 600 wildlife bridges, protecting the endangered European badger, wild boar, red deer, roe deer, among other species. North America, on the other hand, has some catching up to do to make sure furry—and otherwise—friends have the freedom to roam. The crossing infrastructures offer rich potential for learning: infrared cameras installed at crossing sites capture and record animals in transit; Web cams transmit real-time wildlife movement data to science labs and classrooms alike. Photo montage: Tony Clevenger. US 93 through the Flathead Reservation in NW Montana includes an overpass that accommodates large animals, including grizzlies. According to design discussions, it’s at the “best possible location for linking grizzly bear populations to the east with the Bitterroot grizzly bear recovery zone to the west.” Photo By Bill Ruediger. The ARC Wildlife Crossing Competition of 2010-11 challenged interdisciplinary design teams to create the next generation of wildlife crossing structures for North America’s roadways. The hypar-nature design concept combines design, ecology, and engineering into a solution that is both cost effective and elegantly simple. At its core, the design realizes that this landscape is not for humans. Rendering HNTB and Michael Van Valkenburgh and Associates. The site selected for the design competition was West Vail Pass on I-70 in Colorado, about 90 miles west of Denver. Colorado’s I-70 corridor is considered to be a significant barrier to wildlife movement because it is the only east–west interstate providing for the movement of people, goods, and services across the state and bisects a critical habitat linkage in the Southern Rocky Mountain region. The winning hypar-nature design concept combines design, ecology, and engineering into a cost effective solution that recognizes this landscape is not only for humans. The hypar-nature bridging system is inspired by the demands of ecological engineering, distilling the adjacent landscapes and habitats, condenses and amplifies multiple landscape bands (Forest, Meadow, Shrub, Scree) across the structure, and then extends these into habitat corridors that provide connections for a larger cross-section of species. The structure itself is composed of modular precast concrete hyperparaboloid (hypar) forms that allows for minimal site disturbance and easy creation, assembly, and deployment, and can be expanded or adapted as migration pressures dictate. Hopefully this project and others like it will soon be constructed. For more photos of wildlife crossings, see Good.is. Hi! We are the LegoBots a group of from FLL robotics. We were wondering about what your thoughts are for the animal bridges? Vital, necessary, life saving mitigations to road/freeway/railway/pipeline or other infrastructure projects. Our community drivers, Alamo/Danville, CA, Contra Costa County, are highly impacting the wildlife as well as pets. Roadkill is prevalent. Please let me know any local organization(s) interested in the wildlife crossing.